According to the news aired by official Islamic media, seasonal sugar cane cutters went on strike and gathered in front of the factory’s gate in protest against the mismanagement of their retirement insurance as well as their low wages. The striking workers’ representative has told the Islamic regime’s Iranian Labour News Agency (ILNA) that the 2,000 cane cutters who started their strike on Sunday 29 October are protesting against their situation. They demand classification of their trade according to the Labor Classification Plan and an increase in wages. 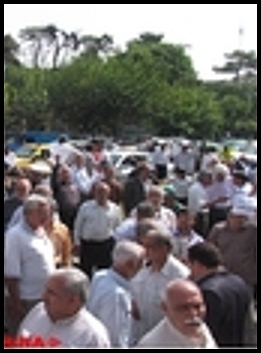 The sugar cane cutters of Shushtar have protested their situation several times during the current Iranian year, including a similar protest action by 2,000 cane cutters in February 2012. These workers also protest the delays and other irregularities in the payment of their wages. One regime official has admitted that many of the striking cane cutters are of retirement age but continue to work because the employer has not paid their retirement insurance. This is one of many common threads connecting the demands of the Shushtar cane cutters to all of the 12,000+ workers of Karoon Industrial Agriculture, the workers of other sectors in Khuzestan, and workers throughout Iran.